Bible Cartoons: Mugs, Surveys & stuff! I’ve been very busy over the past few days creating an email that asks for people’s view about the new “Bad Day” mugs I’ve designed. I’ve been sending an excel spreadsheet with the 19 seperate designs in it, which can be moved around quickly & emailed back to me, so that I can see the preferences. I did it that way to make it as easy, visual & fun as possible for the person doing the re-ordering. Today I heard from a friend who said she couldn’t open the excel spreadsheet on an iPad – oops, I didn’t think of that! My solution was to send her an Acrobat (.pdf) file with the designs on, & asked her to send me her selection as text in a reply email… not as much fun for her! Then I wondered about creating a FaceBook poll with all the 19 mug designs on it, made in a way that viewers could tick a box & put the designs in order of preference. I looked at a few apps (Poll, Poll for FaceBook, etc) but none of tem could do what I wanted. Lastly I looked into Survey Monkey & managed to create a quick poll-type survey in there which people can use, with a matrix of radio buttons so they can show their most-to-least favourite mug preferences. I hope this helps people to give me their choices! When we’ve got enough survey results in we’ll make the decision about which mugs to print, probably in 2 batches of 8, with 3 getting the chop! 3) A matrix of the 19 designs with radio buttons that allow you to show me your preferences. 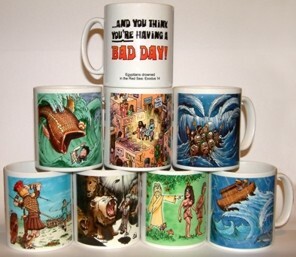 to tell me what your order of preference is for the “Bad Day” mugs.